If you sew and you love to make quilts, you can be sure making a quilt you’re telling your love ones how much you love them. To say “I love you” there’s more ways than words to say it. 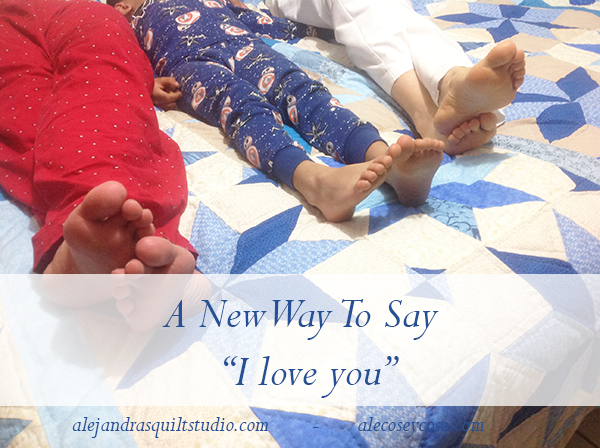 When you love your family, I’m sure you will be looking for different ways to say it to your love ones, and making a quilt is one more way to do it. When you finish a quilt and you give it to your kids or to your husband, or to your mom or dad, you can be sure every time they get into their room and they will look at that quilt on their bed, they will remember you and they will be sure how much you love them!. There’s nothing better that to sleep under a quilt! If the sky has millions and millions of stars, a quilt have millions and millions of stitches to say how much you love your love ones. More than a million of stitches and sweet dreams every night! I just can think of the first women making those quilts, saving each tiny piece of fabric and making tiny stitches to hold them together to be able to be warm during those cold nights. And you and me do the same, we put everything we can to make the best quilts for the people we love. Each piece and each stitch will tell them how much we care about them, every night. Every minute and every hour you spent making the quilt worth everything you can think of when you finish it and you look how this quilt is placed over your love ones bed. I’m more than happy today to share with you the photo of my son with her wife and their son feet on their new quilt, this photo means for me a happy couple will sleep during the cool nights under their new quilt. Every quilt is a piece of art! Don’t let anyone to tell you another thing, each quilt is a piece of art! When you’re making your first quilt or when your making your latest quilt, you put your heart, your mind and your hands to make it. It doesn’t matter if you’re working with a basic design or a hard design to follow and to make, you do your best on each quilt. There are many quilt tags design on the internet, there are many with nice design and words already made for you to pick, print and applique on your quilt back. 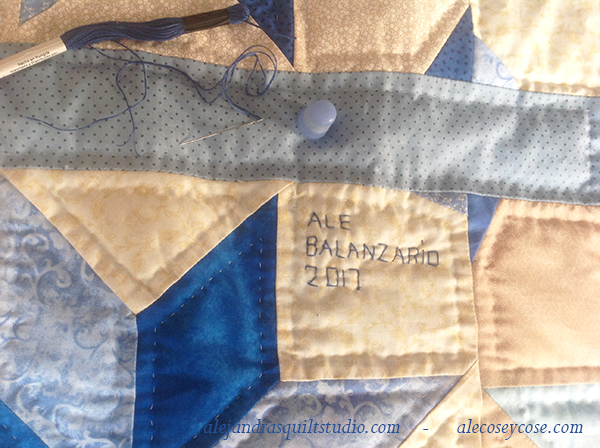 I prefer to sign my quilts in a personal way, this time I signed it on the front of the quilt with my name and the year. Soon I will be back at home in Canada, and I will be working on my next quilt, but I’m sure this quilt will be here in Toluca, Mexico with my son and his wife, telling them every day and night how much I love them. 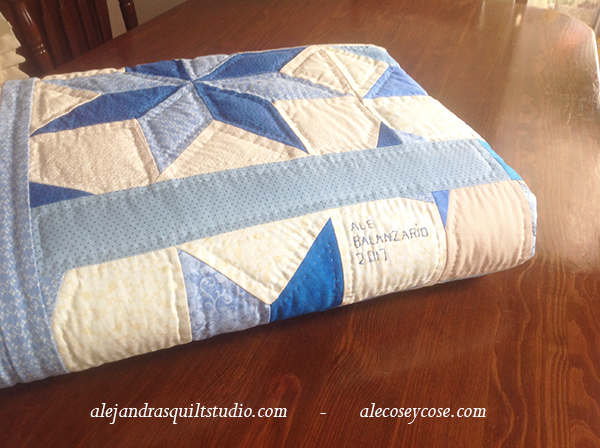 I would love to hear from you now, how many quilts have you made? 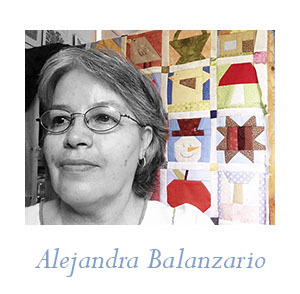 Do you have a particular story of a quilt you made?